Celebrate Your Birthday at the CCC! The Chaska Community Center offers a wide variety of birthday party options. Choose from five different packages offering use of the CCC facilities like swimming, ice skating, playing in the Playroom or gymnasiums. New to the birthday line-up are Themed Birthday Packages - an array of awesome crafts and games to help make your child's birthday celebration truly special! To sign up for a Chaska Community Center Birthday Party Package, fill out the application form at least one week in advance and turn in with full payment for the package. Once approved by the Facility Coordinator, a permit will be issued to the applicant. No reservations will be held without payment. Application forms available at the CCC Front Desk and can be downloaded below. Splash around in the pool and take ride down the 150 ft. waterslide, or wear yourself out in the gym with a pick-up game of basketball! • Unlimited pool/gym use during the open swim/gym hours. Be sure to check the schedule so you know when these hours are. • 2 Free Adult Admissions. Any extra adults that are swimming will need to pay the daily admission rate. • 1 Hour Private Room Rental. You are allowed in the room 15 minutes early without extra charge. You can add in additional room time into the package price, if you feel you want more than an hour, at the regular room rental. Grab your skates and enjoy ice skating with your friends! • Unlimited ice skating time during the open skate hours. Be sure to check the schedule so you know when these hours are. • 2 Free Adult Admissions. Any extra adults that want to skate pay $5 each. Climb and crawl through the castle and take a leap into the colorful ball pit! • Unlimited time in the Playroom during open playroom hours. Be sure to check the schedule so you know when these hours are. • 1 Hour Private Room Rental. You are allowed in the room 15 minutes early without extra charge. You can add in additional room time into the package price, if you feel you want more than an hour, at the regular room rental rates. * Turf available May through late August (limited available in April). • 1 Hour private turf rental. Lace up your skates and let's celebrate! Grab your sticks and pads and get ready to hit the ice for some hockey fun with private ice time! This package is great for birthdays or team parties! Limited ice available during the hockey season (October-March). Skate rental available but not included. This fun filled 2-hour party includes one hour PRIVATE use of the Upper Gym with the Kids Climbing Wall and Inflatable Jump Castle. Then you'll head to your room for one hour for food and gift opening. This package is only offered one Saturday a month - see application form for dates and times - so book now! We've taken the worry and hassle out of planning your child's birthday party, leaving the fun and enjoyment to you with our Themed Birthday Parties. 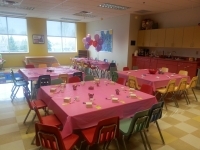 All parties take place in our colorful party room located at the CCC. Your party host will meet you in the lobby by the CCC front desk and walk you to the room. Parties include: 8 kids ($10 each additional guest; LIMIT 14 guests); decorated party tables, paper products, and all project supplies and instructor. Each party consists of up to 1 1/2 hours of structured lead programming with 30 minutes reserved for cake and presents. Options available to add on to your party (additional fees apply): admission to playroom, open swim, open gym, or open skate. Theme Parties are offered one Sunday a month. UPCOMING DATES 2019: May 19th; June 2nd; NO JULY PARTIES; August 4th; September 14th SATURDAY. For more information email Jaime Wiemann, 952-227-7748. Come put the ART in PARTY at CCC's art themed birthday party! Celebrate you child's unique and creative nature by choosing 3 out of 6 available art projects. Remember to dress for a mess with this party! 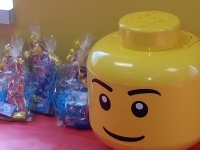 BUILD a day full of fun with LEGOs! Party goers with construct, compete, and let their imaginations take flight as they help create a special day for your boy or girl. Yo Ho Ho and Once Upon a Time combine together for one crazy good time! Join us for a magical birthday when pirates/fairies, and princesses/knights ruled the kingdom. Party planners can choose between games, art projects, and face painting! 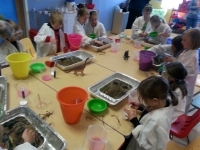 Join us for some oeey gooey fun as we explore the mysteries of science. Your child and guests will do three fun science experiments and a science party game. Kids will get to dress up in science gear including lab coats and goggles. Come and experience a birthday to remember! Talk with the party coordinator for more details. Perfect for older girls or a party leading into a sleepover! Staff will coordinate 1 1/2 hours of activities, with 30 minutes at the end for cake and presents on your own. Lavender will be diffused through the room for that added "spa" feel. You will get to choose 3 activities or projects from a list provided to you by the theme party coordinator after booking. Your SUPER party will start in the gym (or indoor turf when available) for 45 minutes of games geared toward your SUPER theme choice. Then we'll head down to the room for more hero or sport craft/activity fun! Are you looking for something different for your child’s birthday party? Kathleen Theship-Rosales has created individualized pottery projects that are perfect for your next party! Projects may include painting tiles, mugs, clay sculptures and more! if you are interested please call Kathleen at (612) 231-6960. Kathleen will help you coordinate a date.